According to Tiong, the implementation of the overhead bridge costing some RM6 million is a waste of government funds as it would be replaced soon by a flyover. 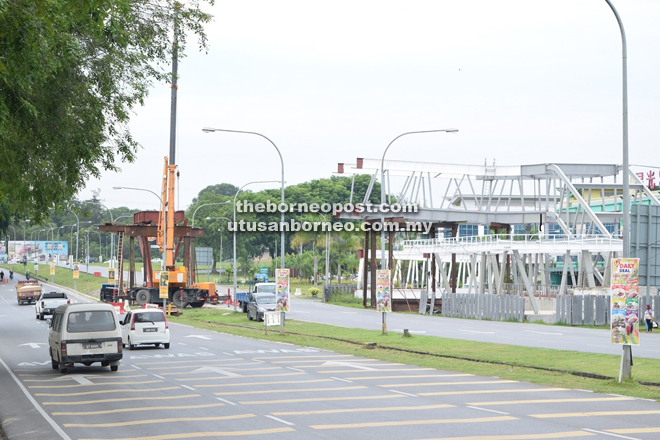 BINTULU: The booming town of Bintulu needs balanced development in order to achieve industrial city status by 2020, revealed Bintulu MP Datuk Seri Tiong King Sing. He said the population of Bintulu has already reached the critical mass of more than 500,000 with the locals making up more than 250,000. The rest of the population is made up of about 200,000 workers in the plantations – comprising approximately 100,000 illegal immigrants and about 30,000 ‘floating’ population (those who come and go for business). “We already target 2020 for Bintulu to become an industrial city. That’s the plan that we want to achieve,” Tiong told BAT6 here on Monday. He said the Bintulu Development Committee (BDC) headed by the Bintulu Resident includes all the government agencies. “We need proper planning so that development will not be carried out haphazardly. Hopefully, things can be done properly in the next five years,” stressed Tiong. Tiong strongly advised that state and federal government agencies must work closely together. “There is poor communication between the various government agencies, between the state and federal. Even the state government agencies are not communicating properly with each other. Certain officers and minsters don’t see the problems of the people,” said Tiong. He pointed out that due to poor drainage some parts of Bintulu are prone to flood, attributing the situation to severe siltation in both the Kemena and Sebiew rivers. “Each time there is a flash flood (here in Bintulu), the people will suffer. I do not know why we can’t address this issue properly. I believe that there is a need to dredge both the Kemena and Sebiew rivers. “I can even make this challenge that if this doesn’t work I will resign. But if this plan works, the minister (of Urban Wellbeing, Housing and Local Government) must resign. I say this because I am really fed-up,” he said. On a related issue, Tiong said he has been requesting JKR for at least three traffic lights to ease traffic congestion to the Bintulu Airport. “At one of these junctions, many people have died. I raised the issue in 2006, 2008, 2010, 2012, 2013, and 2015. The cost of the traffic light is only about RM1 million. When I checked with JKR yesterday, they said they had rejected the plan again. “But in the coming Parliament sitting, I will highlight this issue again and I will not give face. A case in point is when a man died in a road accident there and his wife has small children to look after and now she does not know what to do. Now what am I going to do with this case? This is a very shameful thing. “And a minister just announced a project to upgrade a section of the road to Bintulu just before Chinese New Year, but now six months later, the money hasn’t come. So ministers cannot just announce projects for publicity. There must be proper planning for roads, drainage and housing. As of now, there are many projects which were implemented haphazardly,” Tiong lamented. On the Samalaju Industrial Park, Tiong said there is an urgent need for a well-planned road network to ensure better mobility for the investors, workers and general public. “We need to improve the road connectivity to Samalaju. When we have better road networks it shows that we take care of them. That should be part of the planning. This kind of planning should be done when the officers go to the ground and not by those who sit in the office so that they know what the people want and what they need. This is what the PM has stressed,” he said. Tiong also wants the Pan Borneo Highway project to include upgrading of the coastal road from Bintulu to Miri into a double carriageway to provide easier travel between Bintulu and Samalaju, as well as from Samalaju to Miri. He also highlighted the need for the local people to be given the chance to participate in the overall development of Bintulu such as in small and medium enterprises (SMEs), oil and gas works and contract works. “I have mentioned this in Parliament. If we do not have enough skilled workers then we must train our people. I am not saying all the jobs should be given to the locals but at least 20 to 30 per cent of the jobs should be given to them,” he added. Meanwhile, Tiong who is also the Ambassador to the Far Eastern countries namely Japan, Taiwan and South Korea revealed that discussions have been held with Taiwan on certain projects such as agriculture. “For example, on how to have increased yields for our paddy farmers. As for Japan and South Korea, nothing has been finalised yet as there is a need for the state government to help as well,” he added.